Started the day off trying and failing terribly at making flatbread. My dough was waaaaay to sticky and I realised I didn’t have a griddle pan or even a big enough sandwich press to cook it in, so the end result was rather raw. Tasted alright though! I thought that would fill me but no, an hour later I was hungry and I found myself constantly looking at the clock waiting until I could make lunch! 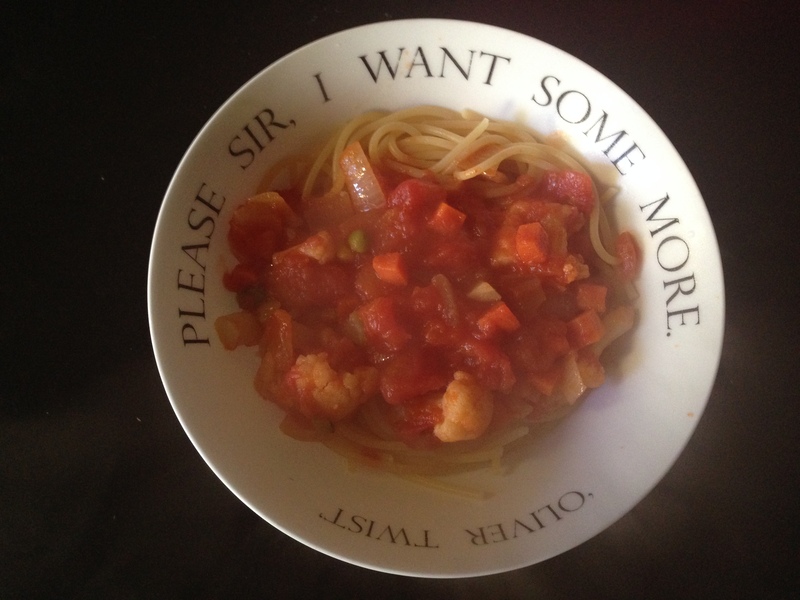 Today was my cooking day: I made tomato pasta sauce with frozen veggies and a pot of dahl to keep me going over the next couple of days. The pasta was nice, and about the same portion size as I would usually eat. Somehow though I still found myself hungry on my way to work a few hours later. Everyone kept telling me to drink water as that would fill me up, and it does temporarily, but man cannot live on water alone and I like to snack! Snacks are good! To top things off, the dahl did not make nearly as much as I would have hoped! I am at least one serve down, which I did prepare for, but it means I will be living off mostly soup for the last two days.